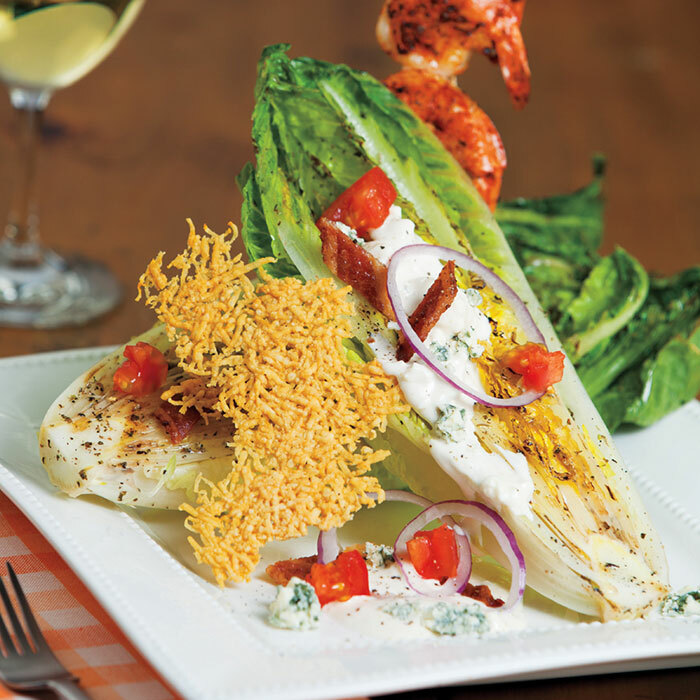 Take your grill skills to the next level with this fantastically flavorful Grilled Romaine Salad! Prepare Grilled Romaine Salad: Soak skewers in water 15 minutes. Preheat oven to 300°. Line rimmed baking pan with nonstick foil or parchment paper. Spread cheese in single layer on prepared baking pan and bake 5 to 6 minutes or until golden brown. Let cool; break into large pieces. Prepare outdoor grill for direct grilling over medium-low heat. Place 5 shrimp on each skewer; sprinkle both sides with Cajun seasoning. Trim core from romaine and cut each head lengthwise in half through core. Brush cut sides of lettuce with oil; sprinkle with salt and pepper. Oil grill rack. Place shrimp skewers and lettuce, cut side down, on hot grill rack. Cook shrimp 4 to 6 minutes or until shrimp turn opaque throughout and internal temperature reaches 145°, turning once halfway through cooking; cook lettuce 3 to 5 minutes or just until outer leaves are wilted and charred.